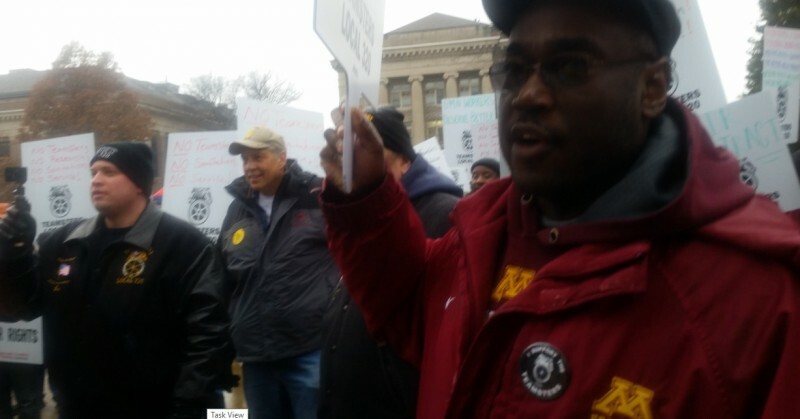 400 University of Minnesota Teamsters march for raises and respect | Fight Back! After the rally at the administration building, workers marched on the Donhowe Building, which houses the university labor relations officials. The U of M is proposing Teamsters accept a three-year contract that includes a paltry increase in the first year, and no wage increases for the second and third years. The rally drew support for a number of other labor organizations, including the campus clerical union AFSCME Local 3800, the United Food and Commercial Workers, and the Minnesota Regional Labor Federation. Local 320 Teamsters held an action the previous day, Nov. 16 on the Crookston, Minnesota campus to press the demand for a fair contract.